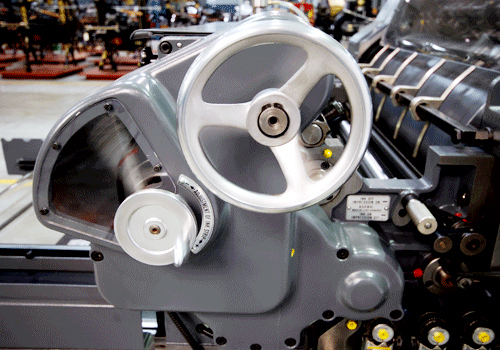 Schnellpressenfabrik Heidelberg not only brought the T platen to market with huge success but also the cylinder press. 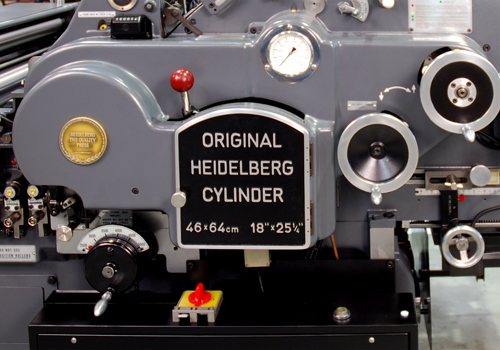 In 1935, Schnellpresse launched the OHC (Original Heidelberg Cylinder). This press, made in a 19 x 25 ½" sheet size (48 x 65 cm), was designed as a continuous or single revolution. That means the cylinder is oversized to compensate for the bed's return and, therefore, does not need to stop or lift on the bed return. In the mid 1800's, this design principle was common in England and America. First imported into America by David Napier of England in 1824, then somewhat replicated by the R.Hoe Co. in 1830. German firms were also starting to use the single revolution design, but quickly abandoned it in favor of the two-revolution and stop cylinder designs. Heidelberg made a great many improvements to this concept, and it was of little surprise that in 1957 having newly ensconced themselves in the "super factory" in Weisloch-Waldorf, Schnellpresse started to build smaller versions. These were referred to as the K-Letterpress "K" meaning "Klein" (in German) for small. What a hit is was. The first machine was the KS, followed by KSB , KSBA, and finally around 1970, the KSD. Heidelberg produced the K-Letterpress from 1957 to 1980 - 23 years. 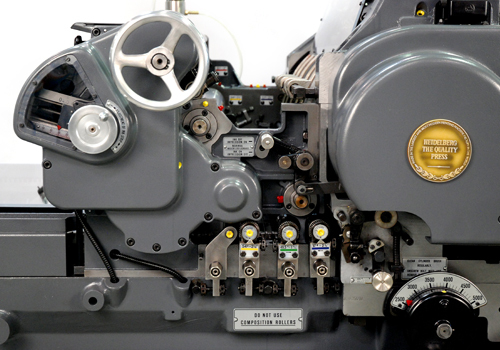 The continuous running cylinder and delivery were also the basis of Heidelberg's first offset press - the K-Offset (in 1962). Over half the parts fit either machine variant. 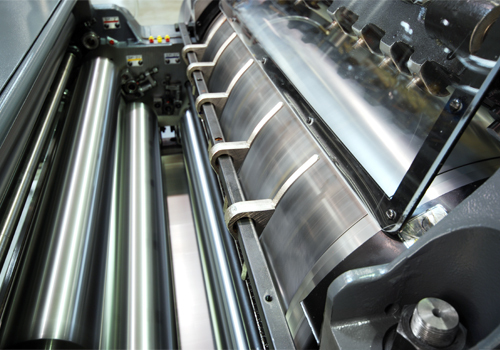 The delivery gripper system proved less desirable for die-cutting as compared to the OHC (except the SBD which had the same system as the K), but because of the ease of use and strength of impression, hundreds are still in use around the world. Our press was rescued from a rough life. It had been used for die cutting and this is still a very popular usage for both the OHC and the K letterpress. We searched for as new a machine as possible and found a 1976 KSD with the inker still attached. 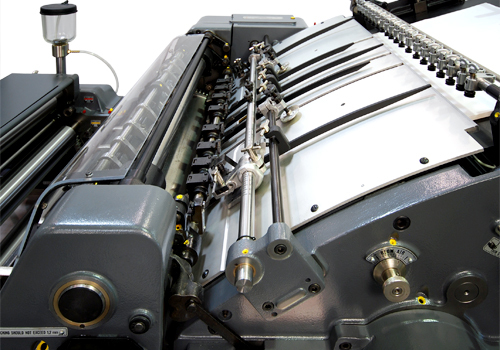 Many machines had the inkers removed for ease of use when cutting and creasing. 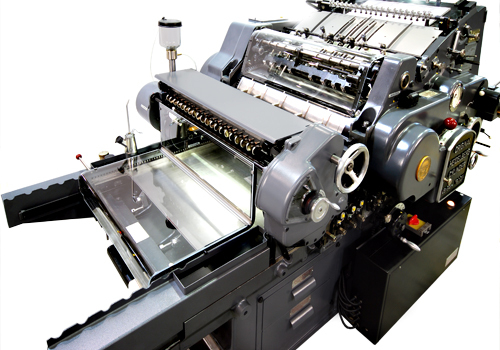 After extensive repairs and rebuilding of the inker, we have a perfect press example of the wonderful 18 x 25 1/4" KSD. The last model designed by Heidelberg and possibly the newest in Canada. This press will be used for printing in our museum. 46 cm x 64 cm - 18" x 25 1/4"